The cosmic voyages of Quarkspace, though still as spaced-out as ever, have returned to Earth. Drop has less to do with a "space drop", and more to do with Timothy Leary's famous quote, "Tune in, turn on, and drop out." Shortly after announcing their retirement from live performance, the band announced that their much anticipated third studio album, would be released free into the public domain. Considering the anti-corporate/anti-establishment nature of many of the lyrics, it is certainly fitting. Musically, Quarkspace are at their strongest. Drop finds a midpoint between the more song oriented material of their first studio album and the longer, spacey freakouts of The Hidden Moon. The band's playing is tighter than ever, the songs are great, and Chet Santia's vocals have dramatically improved. Song oriented tracks include the opening cut, Spinnin', showcasing some great piano work from Jay Swanson and Santia's searing vocals, and the excellent Sound Inside You, with its catchy melodic hooks, anti-corporate message, and harmony vocals by Bevin Lynch and Kendra Lewis. The Storm is a piano-based pop tune with a Beatlesque melody and nice psychedelic touches, which has a darker sounding sister in Drop Out From the World. Rounding things off is The Lie, which in the tradition of The Circle from The Hidden Moon, takes its cue from early Pink Floyd, and features mellow acoustic guitar and more excellent piano (one of the things I really enjoy about this band is the way they use the piano so effectively, something not a lot of space rock bands do). Instrumental tracks include Pavlovian Causeway, a bouncy bit of electronica that sounds curiously like a lost Nash the Slash track, and features a guest appearance on synth by Architectural Metaphor's Greg Kozlowski as well as some outstanding melodic bass playing from Santia (it's deep in the mix, so listen for it). In contrast, the deeply spacey Newton's Dream has some eerie, almost bluesy bass, freaky twin guitars, brooding piano, and washes of intergalactic waves. VAZT is an intense electronic workout featuring three synth players, and Bonny Doon, another space fest, is full of complex percussion. Continuing on from where The Hidden Moon left off are Starbridge Freaks 2 and 3, the first a pulsing piece of cool electronica, the latter a moody rocker with nice work on the skins from Paul Williams and dark and edgy guitar-work courtesy of Stan Lyon. The album ends with the thoroughly astonishing epic, Blanket Hill, featuring the spoken words of Thom the World Poet Woodruff, who theorizes that the tragic Kent State University killings in 1970 were a major turning point in the evolution of humanity. He goes on to explore the consequences in current events of today and the future of humankind being "unarmed as an evolutionary choice". Underneath his words, the band plays some truly frightening space rock that underlines the dark and scary theme of the lyrics (even more relevant after the events of September 11). As the World Poet finishes his musings, the band finally breaks out into an intense, high energy jam with several other guest musicians including Greg Kozlowski again, this time on synth and guitar, as well as Steve Hayes on synth, and Cameron Tummel providing excellent percussive backing to Paul Williams' drumming. Drop may lack a bit of the conceptual feel of The Hidden Moon, but more than makes up for it with some of the best song writing and instrumental explorations Quarkspace have ever produced. And of course, you can't beat the price! 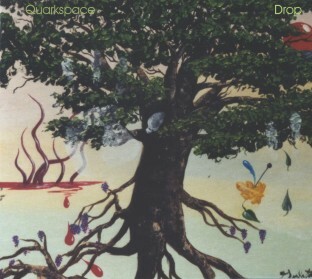 To download the entire Drop album in Mp3 format you can visit the Quarkspace web site at: http://quarkspace.com. Contact via snail mail c/o Eternity's Jest Records; PMB 212; 1487 W. Fifth Ave; Columbus, OH 43212.